Includes one OneTouch G2 1500 and a LinkRunner AT 2000 tester for wired path performance testing up to 1G. The LinkRunner AT Network Auto-Tester is the quickest and most complete copper and fiber network connectivity tester. 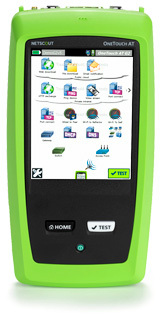 This rugged, handheld network tester speeds troubleshooting and reporting with a comprehensive one-button AutoTest and zero-touch Link-Live cloud reporting.